Killer dolphins with knives and pistols attached to their heads. It might sound crazy, but that’s reportedly one element of the Ukrainian navy’s restarted marine mammal program. Largely, using dolphins for military purposes is no secret. The U.S. Navy trains dolphins to hunt mines, and tests several dolphin-based systems designed to stop enemy divers from infiltrating harbors. The Soviet Union had a dolphin program of its own based at the Black Sea port of Sevastopol until the USSR cracked apart. 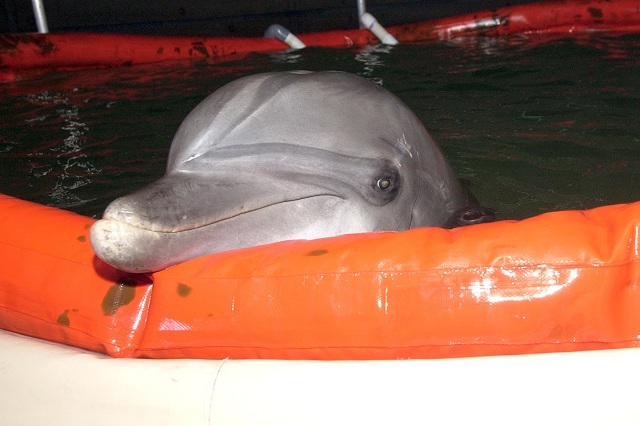 The Soviet dolphin unit stayed in Sevastopol, but ownership was transferred to Ukraine, where it was kept afloat by switching to civilian tasks like working with disabled children, according to the agency. Now they’ll be trained to kill, allegedly. If so, it won’t necessarily be the first time. Russian commandos trained to fight dolphins in case the animals were ever used against them. The Soviet navy once deployed dolphins armed with hypodermic syringes loaded with carbon dioxide, according to one dolphin expert who advised the Sevastopol base on caring for the animals after the program first ended. Soviet dolphins were also purportedly trained to attach mines to ships, and were attached with parachutes before being thrown from helicopters. But whether the Ukrainians are attaching pistols to the dolphins’ heads — that’s a little iffy. The program “sounds directionally on point,” e-mailed Webb, whose unit practiced diving with U.S. Navy dolphins. But “attached firearms to their heads seems far fetched.” For one, dolphins can be lethal without a weapon attached to their heads or snouts. Ukraine will also have to devise a contraption to set off a blast. But a triggered-on-contact “bang stick” — which are used to scare off sharks — risks inadvertently killing or grievously injuring any dolphin armed with one. The U.S. also has the Shallow Water Intruder Detection System, which uses a sea lion equipped with a spring-loaded clamp that can be attached to a diver’s legs. The sea lion then swims back to its handlers, who can reel the enemy diver in like a snagged fish. The Navy has also deployed dolphins to the Persian Gulf to help detect and clear underwater mines. Animal rights groups, though, haven’t been happy about it. No word if Ukraine is trying something similar. Finally, there’s a big risk in arming dolphins, as they could easily become a danger to your own side. “Since dolphins cannot discern the difference between enemy and friendly vessels, or enemy and friendly divers and swimmers, it would not be wise to give that kind of decision authority to an animal,” the U.S. Navy states in its FAQ about the mammal program. If the Ukrainian navy is in fact arming its dolphins, Kiev’s admirals might want to take note of that.